Pixies haircuts come in all shapes and sizes, from fluffy and feminine to boy-cut butch. 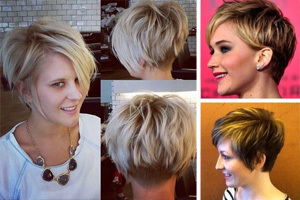 And today’s top 10 stylish pixie cuts all have strong, clean lines to ensure you look trendy and attractive! I’ve included several different pale blonde shades, and the latest salmon-pink satin blonde, to help you choose the best ash-blonde shade for your skin-tones. 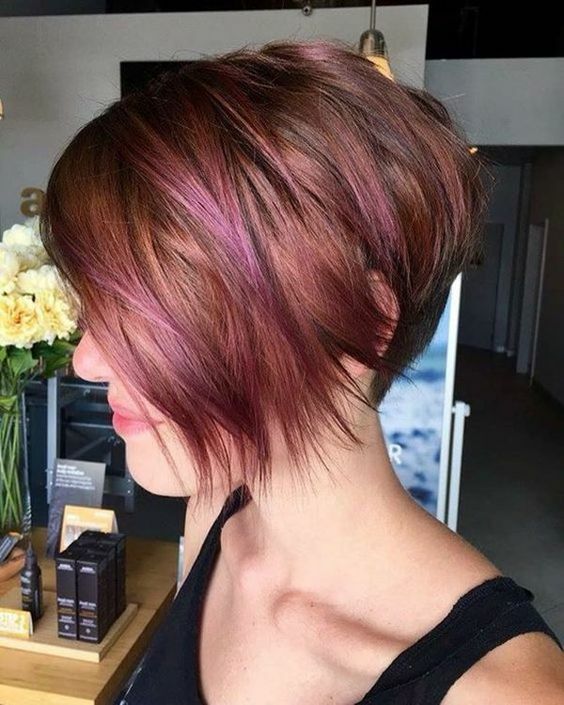 But there are also fabulous brunette short bobs, with original ‘surface texture’, plus violet-pink and mid-blonde balayage! This updated basin-cut creates a lovely modern look, starting with the shaved nape beneath the cute curve of the crown. The hair is lightly layered, leaving the original density intact. And a flattering side-parting, with swept-across fringe, breaks the line at the front for a cute face-frame. The asymmetrical vibe continues in the sides, which have lightly textured tips on one side and smoothly tucked back tresses on the other. 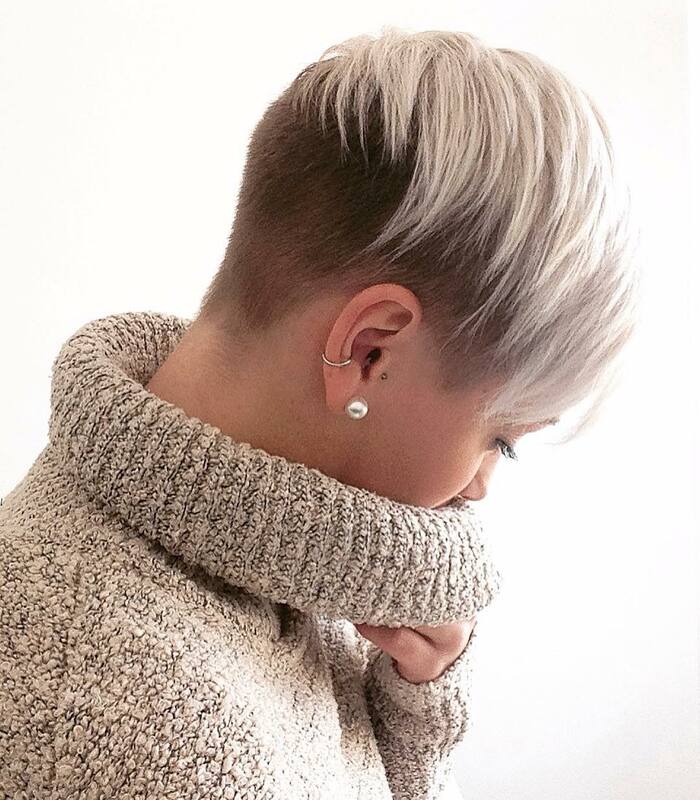 Shaved, squared off side-points complete this fashionable, ash-blonde cut! Here’s a classic favorite in an updated angled bob. The base color is a subtle mid-auburn and copper blend, beautifully highlighted with pink balayage. 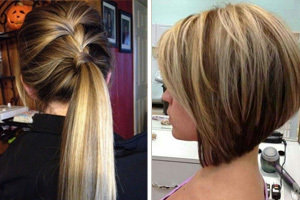 The nap is darker brown and there are dark roots that blend-in, rather than stand-out in this chic, youthful short bob. Curved volume at the back helps create this lovely profile view. And the tips are textured for a fluffy finish to a lovely modern short bob! This cut is best achieved on fine to medium hair, so you get lots of shine and soft curves. 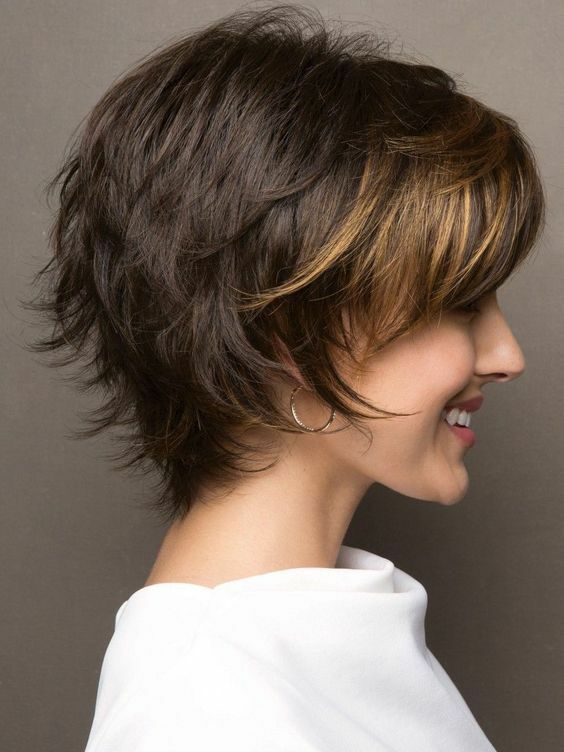 For fine to medium hair types, this choppy layered pixie cut is a great new look. 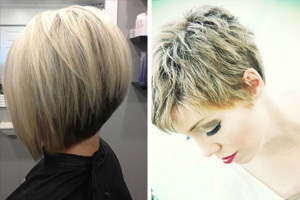 Instead of layers with textured tips that blend and lie flat, this bowl-cut has fabulous texture from blunt-cut layers. 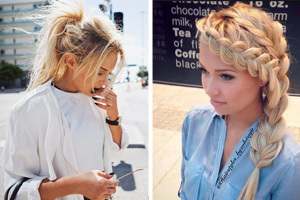 And it’s a good way to add density and a thicker appearance to fine or medium hair. You can also add a curvy pattern in the texture, like this with the side layer cut to dip-down into a trendy V-shape above the darker nape. 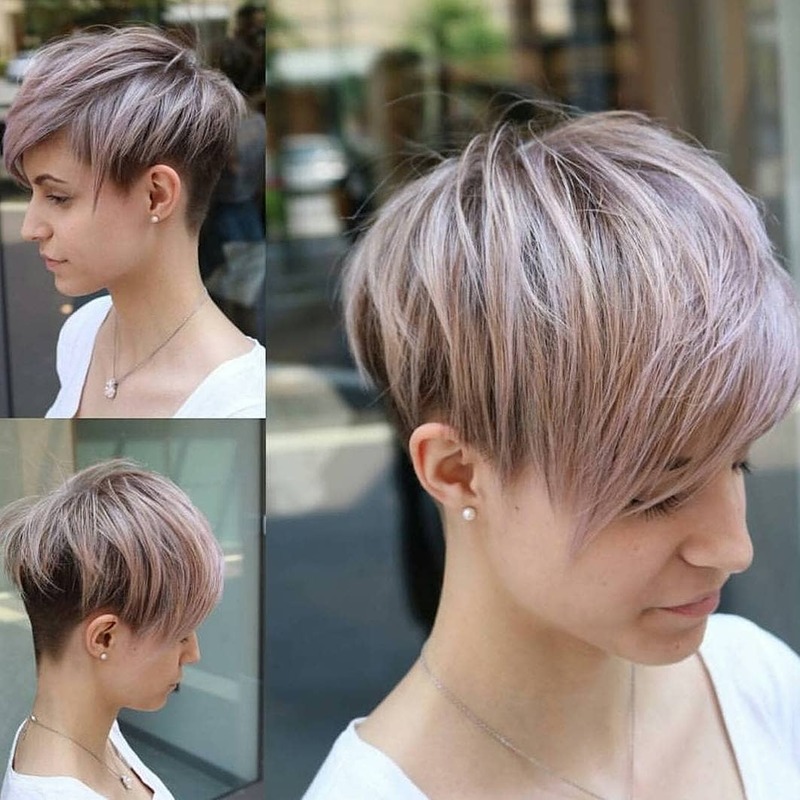 With almost no side-points and in lovely ash-blonde, this is a flattering pixie that’s totally up-to-the minute! This is an edgier look that combines the same basic features as the preceding pixies, but with a completely different final look. It’s a good haircut for fine to medium hair as the broken waves create natural volume on top. The short back and sides echoes current fashions in men’s haircuts, and the side-points are extra-short. Eye-level side-points draw attention to the eyes in a flattering way. And this is another easy-care haircut that’s full of style and personality! The high-buzzed short-back-and-sides of this trendy young look is softened by the lovely color blend in the rest of the hair. Long layers with finely tapered tips allow fine to medium texture hair to lie in pretty tapered sections. And you can see this lovely color contrast in the back- and profile-views above. 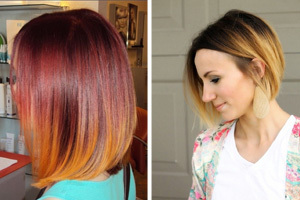 Medium-brown hair has been given a fashionable color make-over with a blend of apricot and lavender-pink. And the extra-long bangs and side-parting make a lovely face-frame in this cute, youthful haircut. No wonder this model is looking so happy, this chic and flattering new haircut is a real winner. Notice how the fringe and some surface strands at nose level create movement to the back? It’s fresh and trendy, but also a clever way to minimize the appearance of a sharp or slightly prominent nose. So that instead of leading the eye forwards and accentuating the size of the nose, the emphasis is kept at the back. The lovely mid-golden blonde balayage creates a focal point above the nose, and that super-cute forward curve lower down, accentuates the mouth. 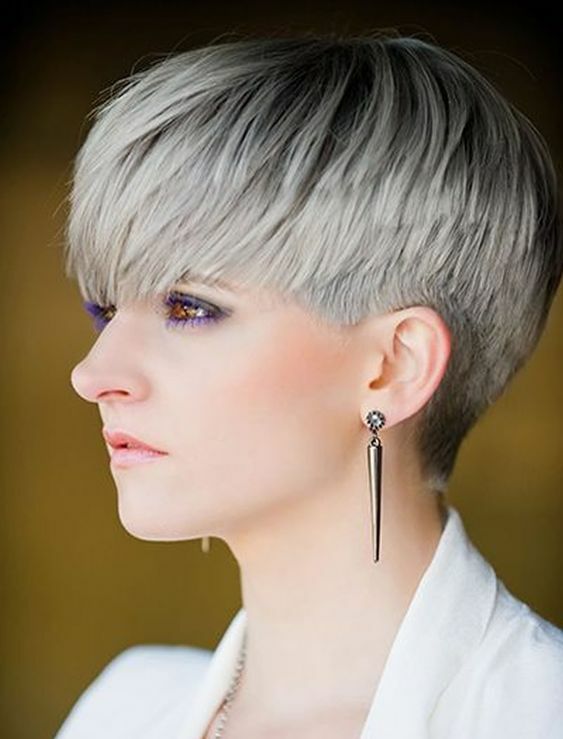 Moving on now to neutral and beige-blonde styles, here’s a great pixie idea for medium to thick hair. The hair is cut into layers like a chrysanthemum flower, which radiate from the crown in a fabulous pattern. 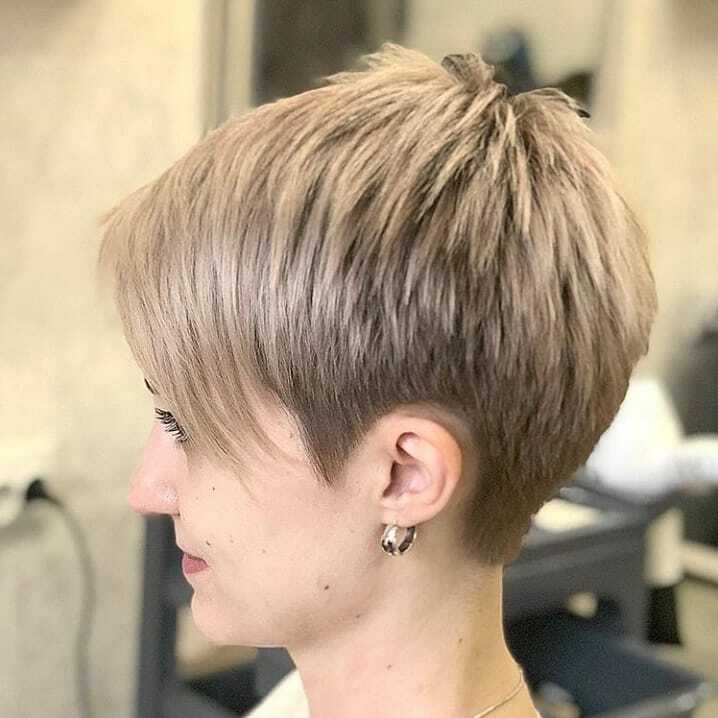 And adding softness to this lovely pixie, are fashionable soft-beige and neutral beige colors that accentuate the 3-D texture. Side-swept bangs are lightly layered with tapered tips. And hair is cut cleanly around the ears with a sharp side-point, half-way down the ear. 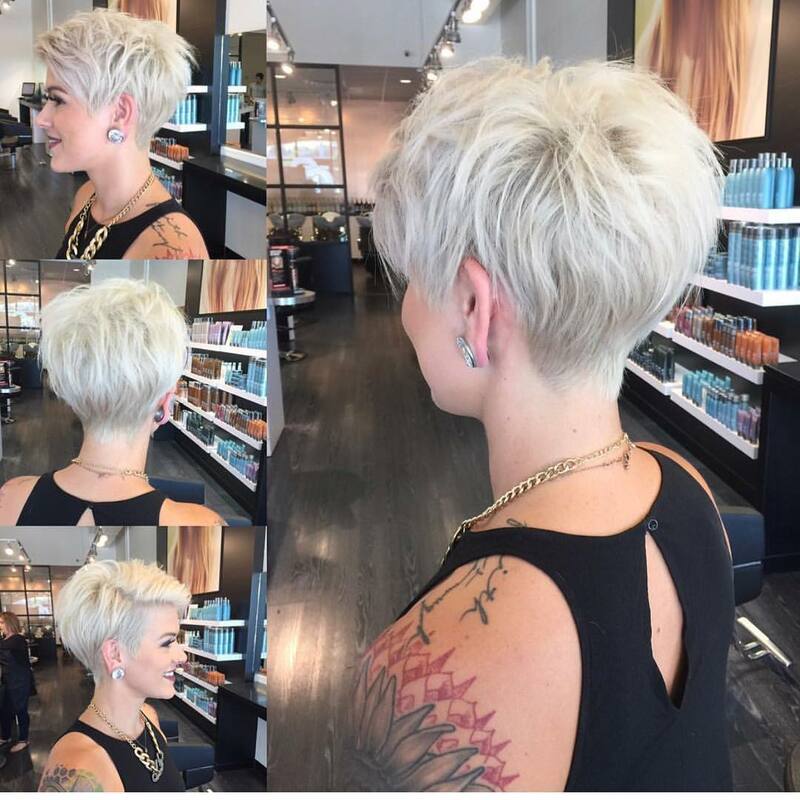 Showing that the platinum-blonde look is still popular with young women, here’s a care-free, tousled short haircut. And if you’re looking for a trendy over-50’s pixie cut, this is equally suitable for ladies with naturally white hair! The back is cut in long layers that emphasize the round curve of the head, before being graduated and shaped into a fashionably V-point at the nape. 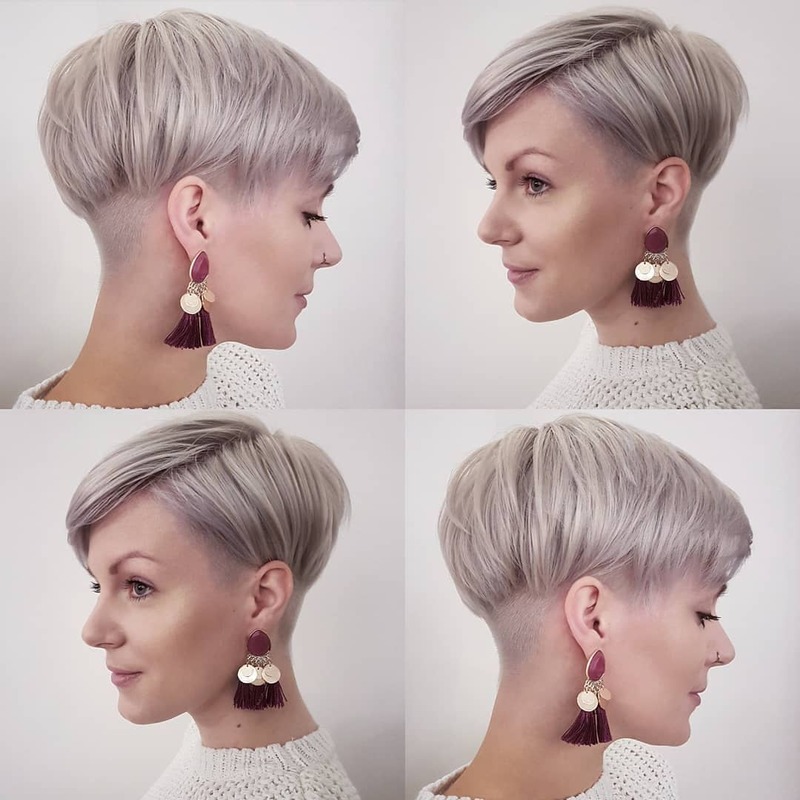 The shorter side has an edgy buzzed and bleached texture, but the long side is shaped into a pretty single point, ending at cheekbone level. 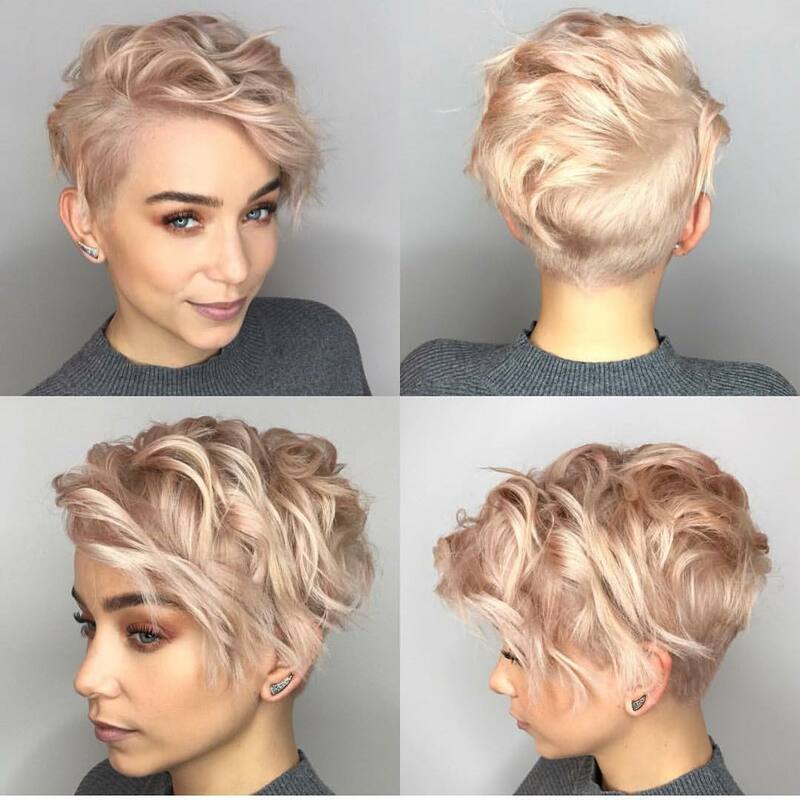 This gorgeously romantic salmon-pink shade is a completely new blonde option. It’s actually a retro color idea filched from the popular pink satin lingerie of the 1940’s! And it’s a delicate blend of pink and pale beige shades, that gleams like a pearl. As a lightly colorized type of ‘ash-blonde’, which contains ‘cool’ pink and ‘warm’ beige – this new shade suits a wide variety of skin tones. The cut has long layers styled in fabulous ripple-waves and a trendy parting at the back for a quirky, dual-textured finish! 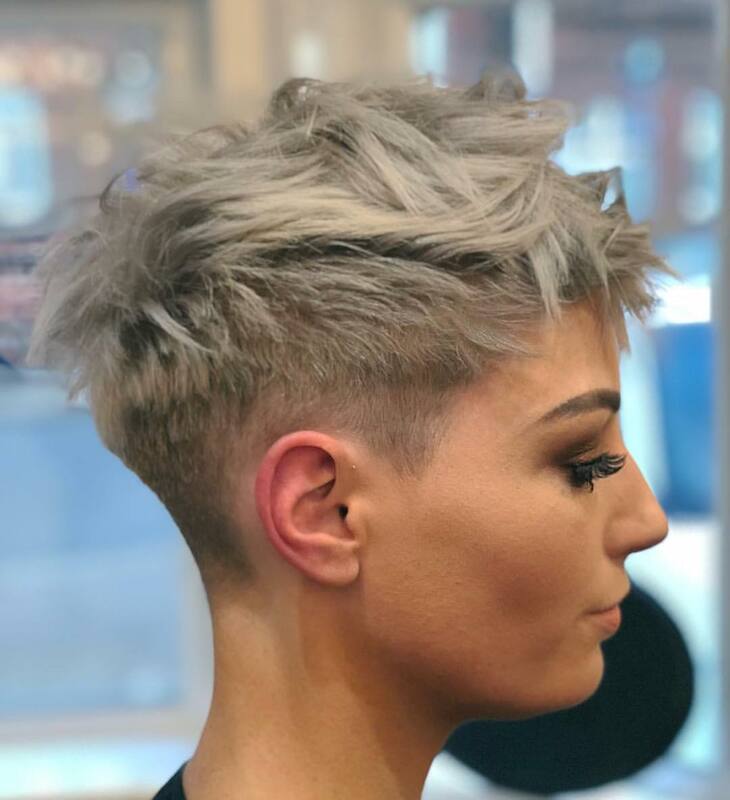 Today’s final short pixie is suitable for all hair types, because even on fine hair, the heavily bleached top will make the hair strands thicker. It’s a high-fashion boy-cut, with an extremely short-back-and-sides buzzed texture and a short side-point. All of the emphasis is on a nicely shaped head at the back and the model’s face at the front. 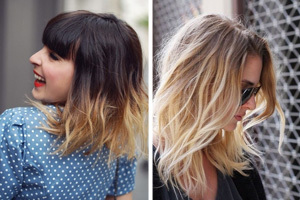 Top layers are long enough to be swept across in an edgy, asymmetrical look. 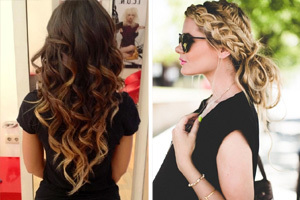 And tapered tips in pale, neutral blonde make a lovely contrast over darker roots. It’s sporty, chic and easy-care – all in one very trendy pixie package!